The research for this article was completed during 2017 by Assistant Curator Sergeant Graham Humphrey using the museum’s archives and specifically the sources listed at the end of this page. 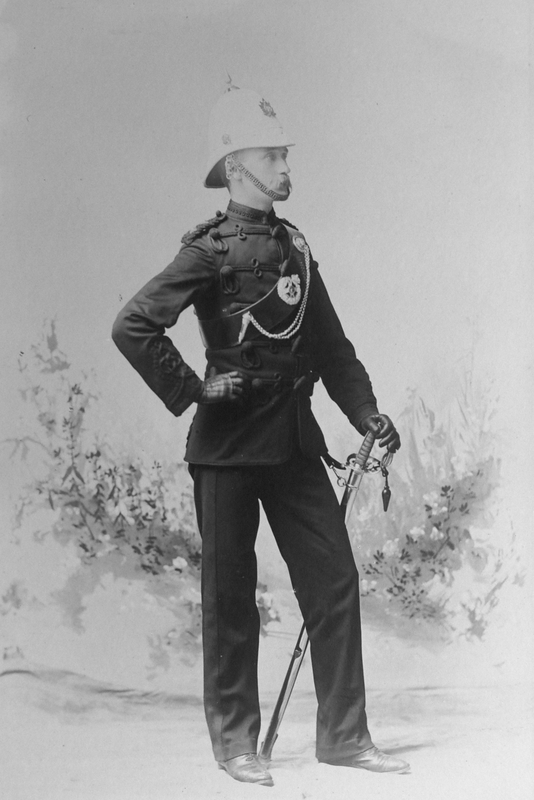 Prior to 1863 the Canadian militia was not issued a standard uniform. These uniforms were improvised and created individually. 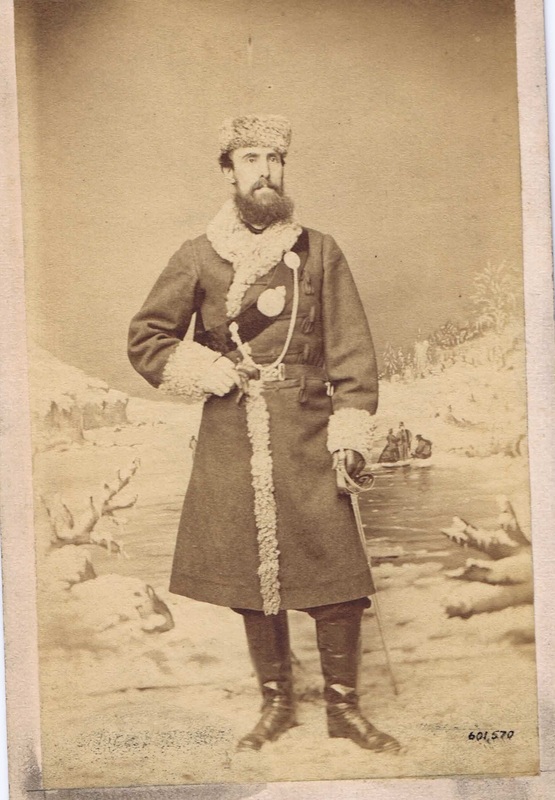 Not until 1863 did the government of Canada begin to issue standard uniforms to its militia. 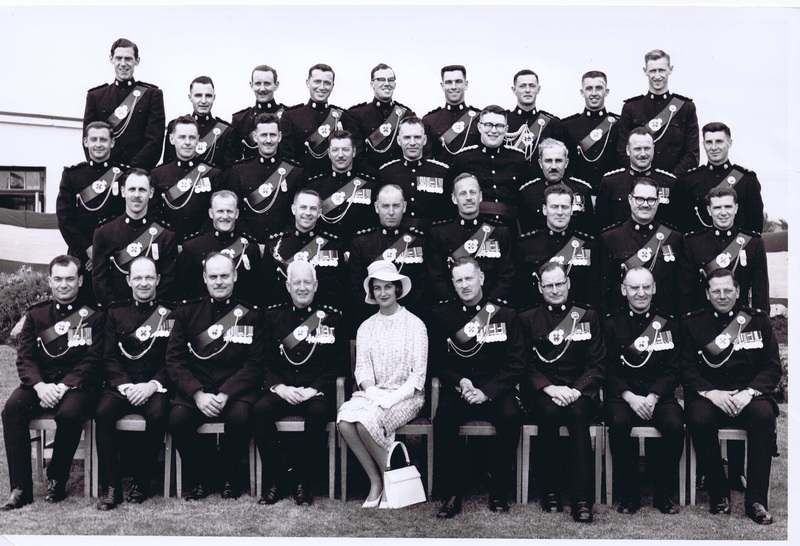 Initially the 2nd Battalion Volunteer Rifles of Canada (as the Queen’s Own was known at the time) saw each of its 10 companies wearing a different form of dress. Little is known of what the officers wore during the formative years. 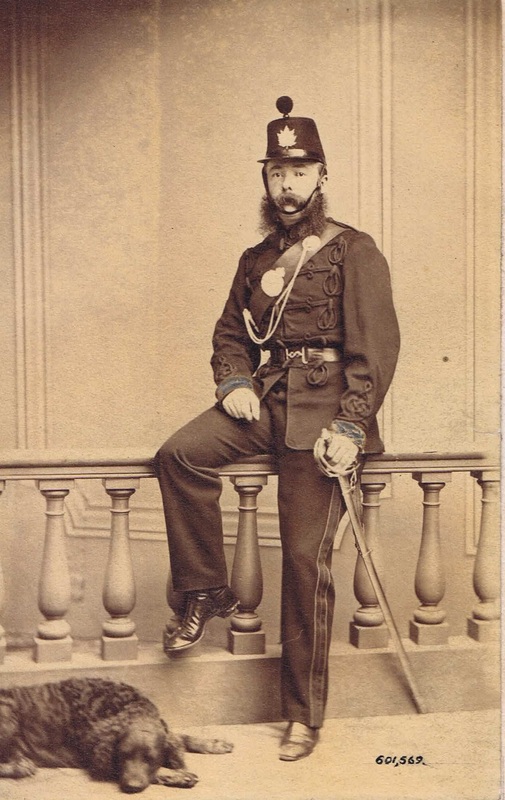 On 12th May, 1864 The officers of the battalion would provide themselves with patrol jackets and forage caps due to the costly measure of the full dress tunic. This patrol jacket was worn at ordinary parades and was of rifle green colour. Little is known of the officers of 1866 but what we do know is from photos taken after the Battle of Ridgway in June of 1866. 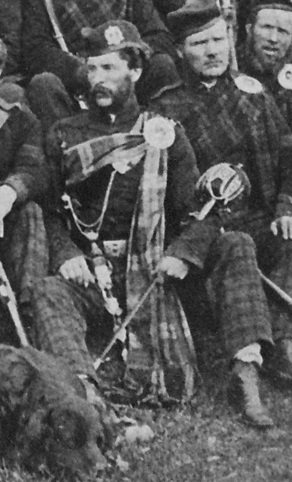 Rifle green cloth, edged all round, except the collar, with black square cord, collar and cuff, scarlet; the collar edged with 1/2 inch black lace, and with the badges of rank, embroidered in black silk at each end; the cuffs pointed and ornamented as described below, according to rank; the skirt rounded off in front, closed behind, and lined with black; on each side of the breast, five loops of black square cord, with netted caps and drops, fastening with black olivets. On each back-seam, a line of same cord forming three eyes at the tip, passing under a netted cap at the waist, below which it is doubled, and ending in an Austrian knot reaching to the bottom of the skirt; on each shoulder, a square cord loop with a black netted button. Field officers have figured braiding below the lace of the collar, and 1 1/2 inch black lace round the top of the cuff, with figured braiding above and below the lace, extending to 11 inches from the top of the cuff. Captains have a row of braided eyes below the lace of the collar, and an Austrian knot of black square cord on the sleeve, with a tracing of braided eyes all round it extending to 8 inches from the bottom of the cuff. Lieutenants have a tracing of plain braid only below the lace of the collar, and an Austrian knot on the sleeve, with a tracing of plain braid round it, extending to 7 inches only from the bottom of the cuff. Rifle green cloth, of the size and shape prescribed for the infantry, with collar and pointed cuffs of scarlet as on the tunic. Black mohair inch braid, traced with black Russia, at the top and bottom of collar, showing scarlet facings. The tracing forms a crow’s foot on top of the cuff, a plume at the top of the back of the jacket, and a crow’s foot at the bottom. On each side to front, five loops of black round cord, with caps and drops, fastening with black olivets. Field Officers wear the badge of their rank on the collar as on the tunic. 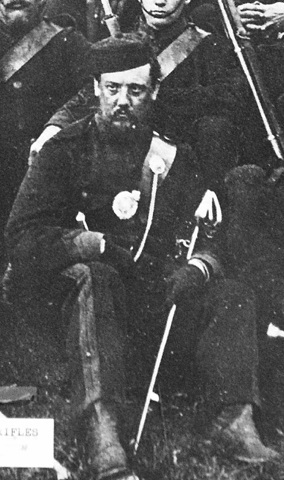 Rifle green cloth edged all round with inch black lace collar and pointed cuffs of the regiment. Facings (scarlet), laced and braided according to regimental patterns. Black silk lacings. Rifle green cloth, edged braided round according to regimental patterns. Sub-Lieutenants wear the same uniform as Lieutenant, except that the badge of rank is a star. They are not to provide themselves with horse furniture. “Officer Tunic Rifle green cloth, edged all round, except collar, with black, square cord; collar and cuffs of regimental facings (scarlet); single-breasted; the collar edge with half-inch black lace, with badge of rank; the cuffs to be pointed and ornamented according to rank. On each side of the breast five loops of black, square cord, with netted caps and drops, fastening with work olivets; the top loop eight inches long, the bottom one four inches. On each shoulder a square cord loop, with a black netted button. On the back seams a single cord, forming three eyes at the top, passing under a netted cap at the waist, below which it is doubled, and terminating in an Austrian knot at the bottom of skirt; the skirt nine inches deep, for an Officer 5 feet 9 inches, with variation of 1/8 inch for every inch of difference in height; to be rounded off in front, closed behind, and lined with black. Field Officers – Collar, laced all round with black lace, with double row of figured braiding within the lace. A crown at each end for Lieut. Colonel, a star for Majors. Sleeve ornament of lace and figured braiding, 11 inches deep. Captains – Collar, laced round the top with black lace, with single row of figured braiding below the lace. Crown and star at each end. Sleeve ornament, an Austrian knot of square cord, with row of braided eyes all round the knot, 8 inches deep. Lieutenants – Collar, laced round the top with black lace and plain edging of braid. A crown for Lieutenant, a star for 2nd Lieutenant at each end. Sleeve ornament, an Austrian knot of square cord and tracing braid, 7 inches deep. Rifle green serge, with scarlet cloth collar, rounded in front, and edged with inch black lace all round; 4 inch openings at side seams; black shoulder cord with netted button; without rank lace; pockets over each breast, without flaps; hooks and eyes in front; 28 inches long for an officer 5 feet 9 inches in height, with 1/8 inch variation for each inch difference in height. Rifle green cloth, edged all round with inch black lace and tracing braid, forming a crow’s foot at corners and at the side seams, black shoulder cord with netted button; scarlet collar, with ½ inch lace and trace braid as follows, below the lace, in each case forming a crow’s foot at centre behind: Field Officers – Double row of eyes. Captains – Single row or eyes. Subalterns – A single line, with ¾ inch lace above the bottom of collar. Black cuffs, with point of 1 inch black lace 6 ½ inches deep, with tracing braid as follows, in each case forming a crow’s foot at the peak, and a braided figure below: Field Officers – Double row of eyes all round the lace. Captains – Single row of eyes all round outside the lace, and single line inside. Subalterns – Single line all round. Black silk lining; pockets inside the breasts; hook and eye fastenings. The collar of the jacket may be thrown back, but not turned down. Rifle green cloth, no collar, open half way down, edged all round with ½ inch black lace and tracing braid, forming a crow’s foot at corners; pockets, edged with tracing braid, crow’s foot at corners and centres; hook and eye fastenings. Dark grey cloth, double breasted, to reach within a foot of the ground; Stand and fall collar, 4 ½ inches deep, with fly to cover the band of cape when buttoned on; loose round cuffs, 6 inches deep; 2 pockets at the waist, in front, 2 openings behind at the side seams, with pointed flaps 11 inches long; and a breast-pocket on the left inside; a slit in the left side for hilt of sword to pass through; an opening behind 19 inches long, with a fly; 2 rows of regimental buttons down the front, 6 in the row; 3 buttons on each skirt flap; 4 small buttons at the opening behind, and 5 small buttons under the fly at the collar; a cloth back-strap attached to the top button of the skirt flap, to confine the coat at the waist; 2 hooks and eyes at the collar. 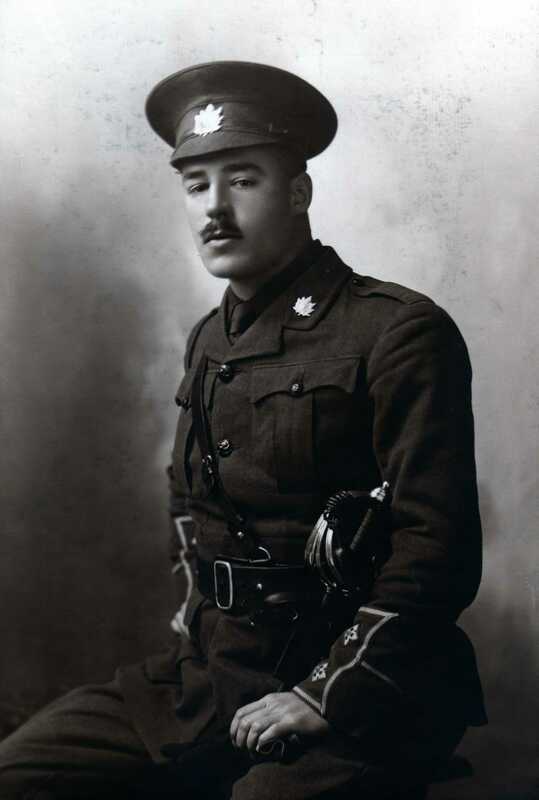 Of same cloth as the Coat, to button on, and coming down to the waist, with 4 small regimental buttons in front, and 2 hooks on the collar, with bronze rosettes and chain fastening. “Tunic Black cloth, edged all round, except the collar, with black square cord. Scarlet cloth collar and cuffs, the collar edged top and bottom with ½ inch lace and a tracing of black braid inside for Lieutenants; the top only edged with ½ inch lace for Captains and Field Officers; the cuffs pointed, and ornamented as described below according to rank. The skirt rounded off in front, closed behind and line with black. On each side of the breast, 5 loops of black square cord, with netted caps and drops, fastening with black olivets. On each back seam, a line of the same cord, forming 3 eyes at the top, passing under a netted cap at the waist, below which it is doubled, and ending in an Austrian knot reaching to the bottom of the skirt. Shoulder-straps of black chain gimp, with small netted button at top. Badges of rank in bronze metal. Field Officers have figured braiding below the lace of the collar, and 1 ½ inch black lace round the top of the cuff, with figured braiding above and below the lace, extending to 11 inches from the bottom of the cuff. Captains have a row of braided double eyes, below the lace on the collar, and an Austrian knot of black square cord on the sleeve, with a tracing of braided double eyes all round it, extending to 8 inches from the bottom of the cuff. 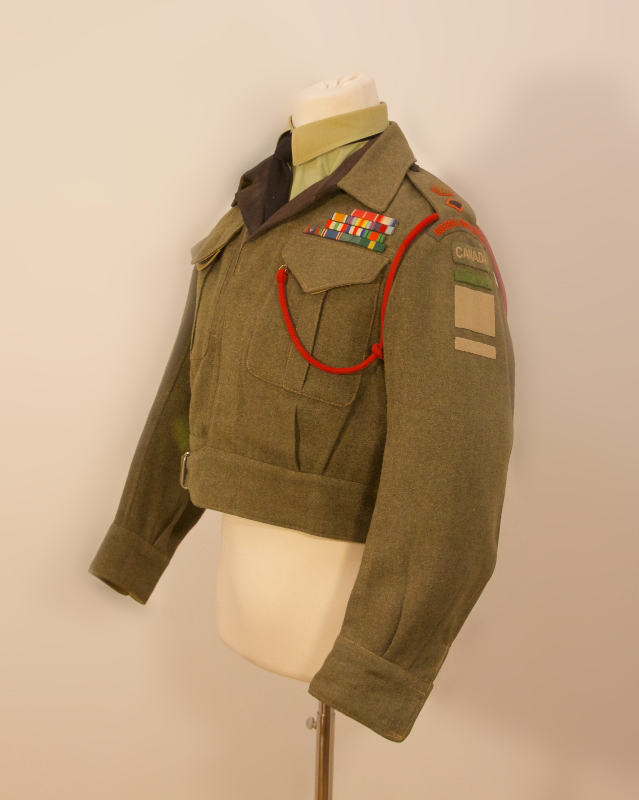 Rifle green serge, scarlet cloth collar, the jacket to be edged all around including collar with 1 inch braid up the vents and along the back seams. Fine loops of inch mohair braid, at equal distances, down the front at each side; the top loops extend to the shoulder seams, and the bottom to 4 inches, the cuffs pointed with inch mohair braid to 5 inches from the bottom, 1 outside breast pocket on each side, let in between the loops. Fastened with hooks and eyes in front, black lining. The shoulder straps of the same material as jacket, edged with ½ inch braid, except at the base, a black netted button at the top, badges of rank in bronze metal, the collar seam covered with tracing braid. Rifle green serge, rounded in front, stand up collar with hook and eye, scarlet piping on the seam, cuffs pointed. A body seam on each side, five regimental buttons on front, 2 breast pockets in each side with flap, shoulder straps of same material as jacket with small bronze button at top, badges of rank in bronze metal. Black cloth, scarlet cloth collar and cuffs, 1 inch mohair braid all round the body, forming barrels at bottom of back seams. Back seams trimmed with a double of ¼ inch braid, forming a crow’s foot at the top, and finishing over the barrels at the bottom; pockets trimmed with ¼ inch braid, forming a crow’s foot at each end and centre. Five waved loops of square cord in front, with four rows of olivets, two on each loop. Pointed cuffs of inch mohair braid, with figured tracing of black Russia braid. Mohair braid ½ inch wide all round the collar and figured tracing in centre; should straps and badges of rank as for tunic. Black cloth, single breasted, no collar, open half way down. Hooks and eyes, ½ inch braid on edges, with ¼ inch braid down the front, 1 inch from the edge. Scarlet cloth between the two braids with rows of eyes of black Russia braid down front edge on the scarlet cloth. Pockets trimmed with ¼ inch braid, forming a crow’s foot at each end, edged all round with scarlet cloth. Gray Melton cloth, double breasted, to reach within a foot of the ground. 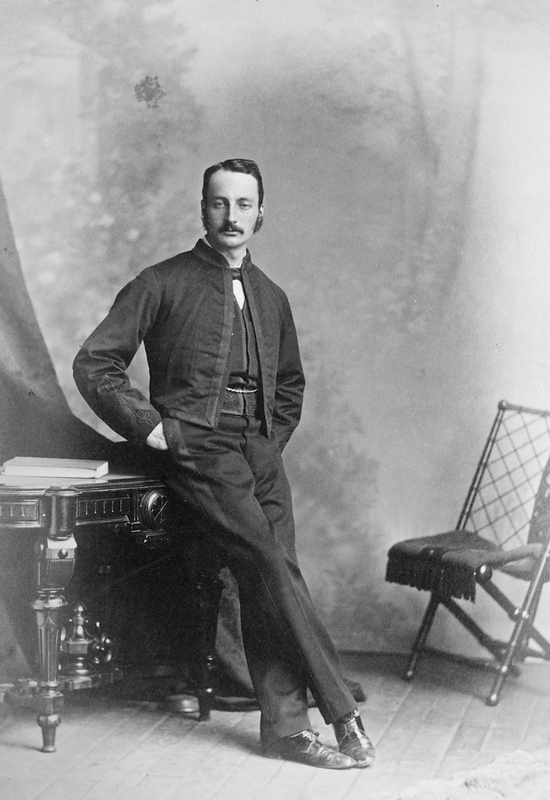 Stand and fall collar, 4 ½ inches deep, with a fly to cover the band of the cape when buttoned on. Loose round cuffs, 6 inches deep, 2 pockets with flaps at the waist in front, 2 openings behind, at the side seams, with pointed flaps 11 inches long; a pocket inside the left breast, a slit in the left side for the hilt of sword to pass through, an opening behind, 19 inches long, with a fly, 2 rows of regimental buttons down the front, 6 in each row, the top buttons 6 inches apart, the bottom ones 4 inches; 3 buttons on each skirt flap, 4 small buttons at the opening behind, and 5 flat buttons under the fly at the collar. A cloth back strap, attached to the top button of the skirt flap to confine the coat at the waist; 2 hooks and eyes on the collar. Shoulder straps on the coat, of the same material as the garment, badges of rank in bronze metal. 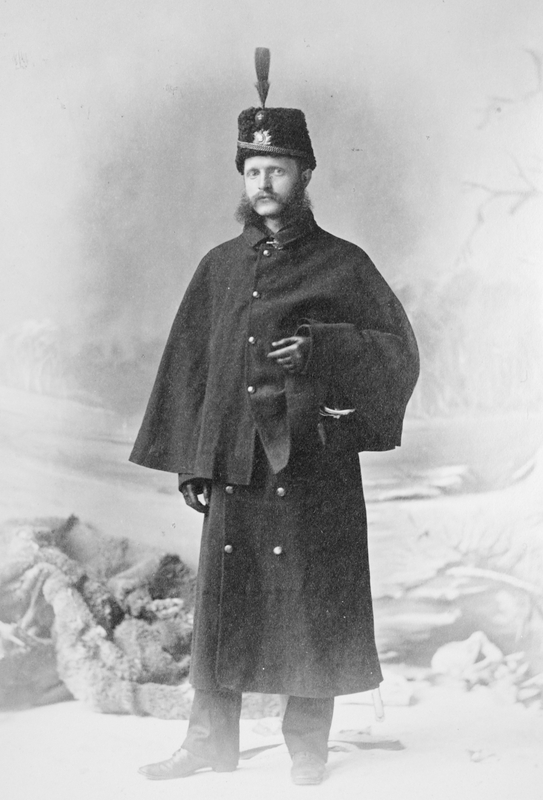 Cape of the same material as the coat, and long enough to cover the knuckles; 4 small buttons in front, to fasten at the neck with bronze metal rose hook and chain. 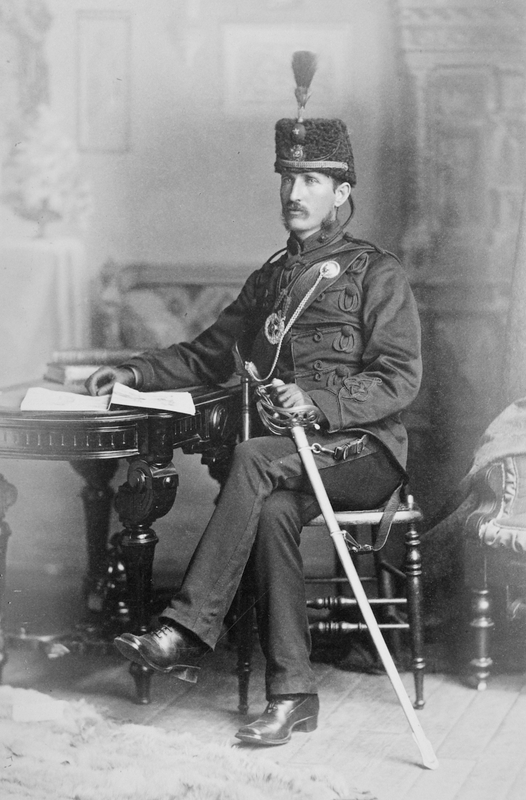 With Sir Henry Pellat paying for the regiment out of his own pocket to bring the Battalion to England for maneuvers with the British Military a new uniform was introduced to the QOR of C. According to letter correspondence between Pellat and the Department of Militia and Defence, this uniform was called “QOR Special.” For the first time khaki was introduced to the regiment. This consisted of a tunic of five large frontal buttons, two chest pockets with small buttons, and two skirt pockets with small buttons also. This had a high collar which rolled down in rifle green Melton wool as well as the cuffs and epaulets which had scarlet trim on the edges. For this tunic it was the first time that a red whistle lanyard was issued for officers. The buttons were of frosted silver. The QOR of C collar dogs were a smaller form of the regiments cap badge in white metal. With the mobilization of the Canadian Militia upon the declaration of war against Germany, the Canadian Militia made their way to Valcartier to be put into battalions. The Queen’s Own contingent was placed into the Third Battalion, Canadian Expeditionary Force. 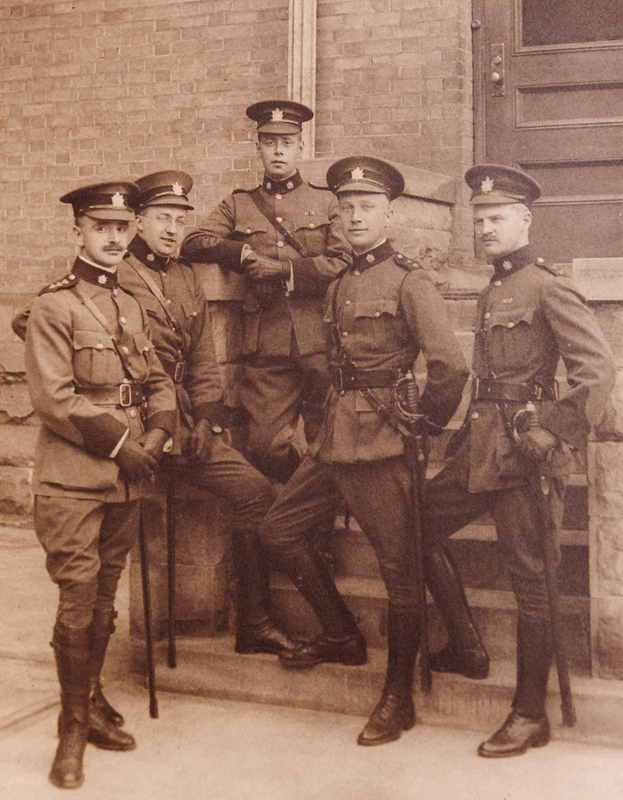 Upon mobilization the officers of the QOR would wear the “QOR Special” style of uniform that was worn since the 1910 trip to England. Upon reaching England the Officers would switch to a new opened collared service dress uniform. This would be of a khaki drab wool with four buttons down the front, pleated chest pockets, two skirt pockets, and bare khaki epaulets. 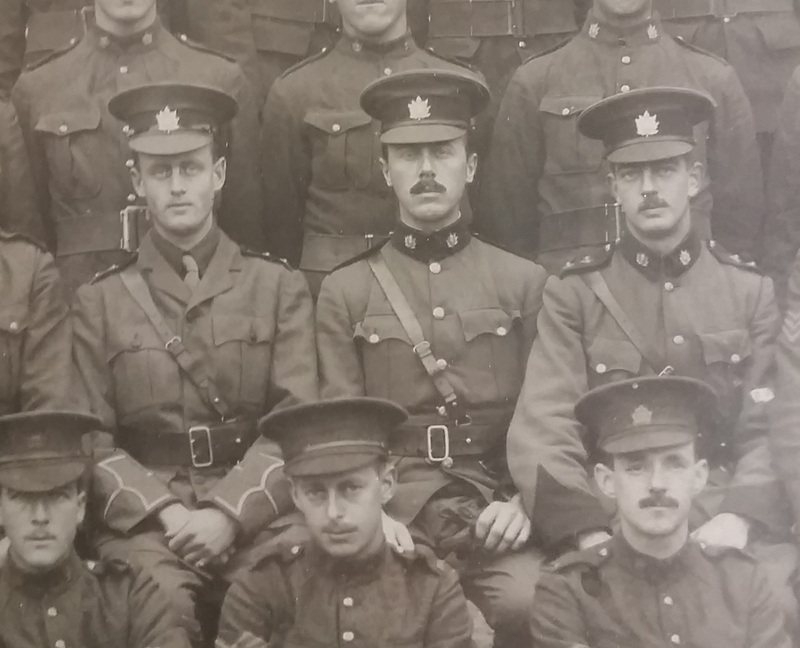 Throughout the four years of war from 1914 to 1918 the QOR recruited members for the 83rd, 95th, 166th, 198th, and 255th Battalions (all of which the QOR would perpetuate) and sent numerous recruits to other Battalions as well. After the end of hostilities the Canadian militia would revert back to what it was before hand with the Canadian Expeditionary Force soldiers returning to their own respective units. 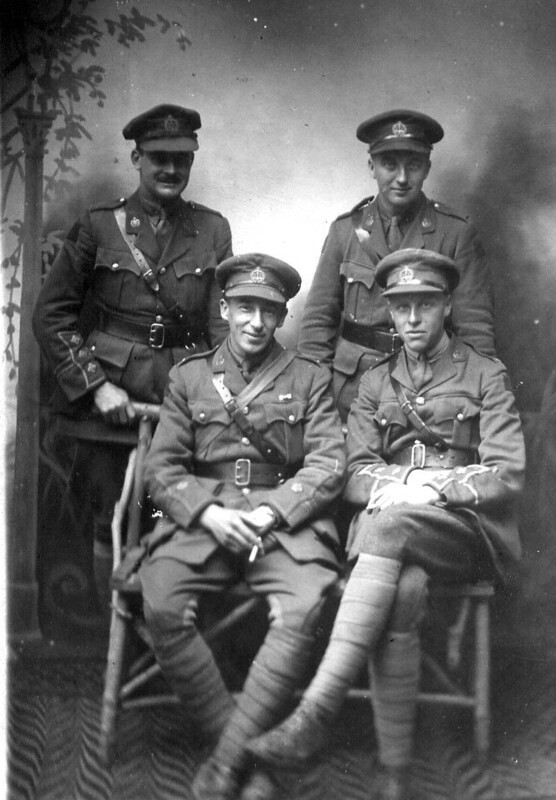 The Third Battalion which did not fight under the QOR cap badge had its troubles with members arguing about loosing their traditions that they earned through fighting throughout the Great War. 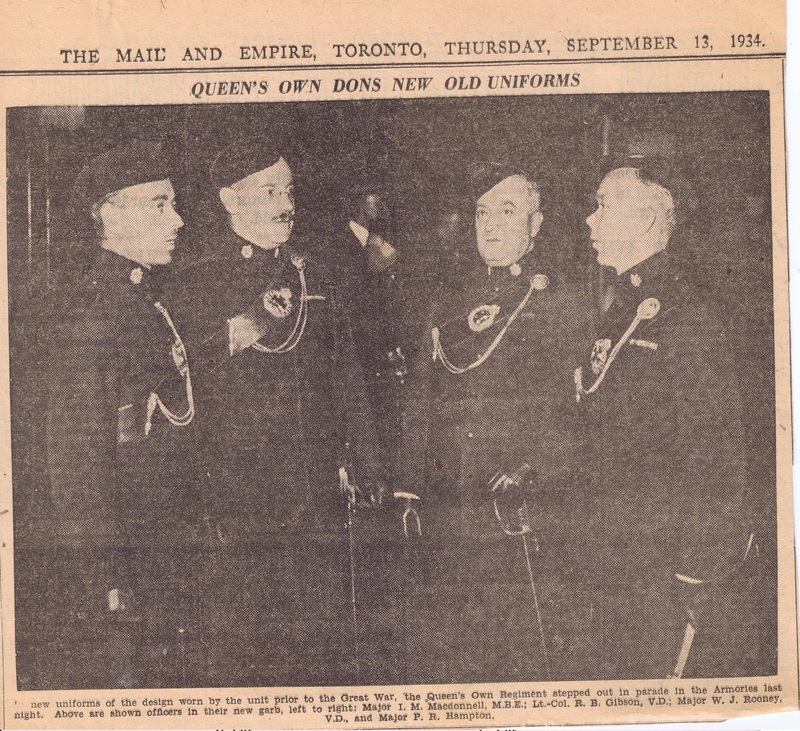 The many members who were not QOR pre-war, would form their own Regiment called the Toronto Regiment. The QOR reverted back to pre-war full dress uniform but would change their service dress to that of the war pattern with no coloured facings. 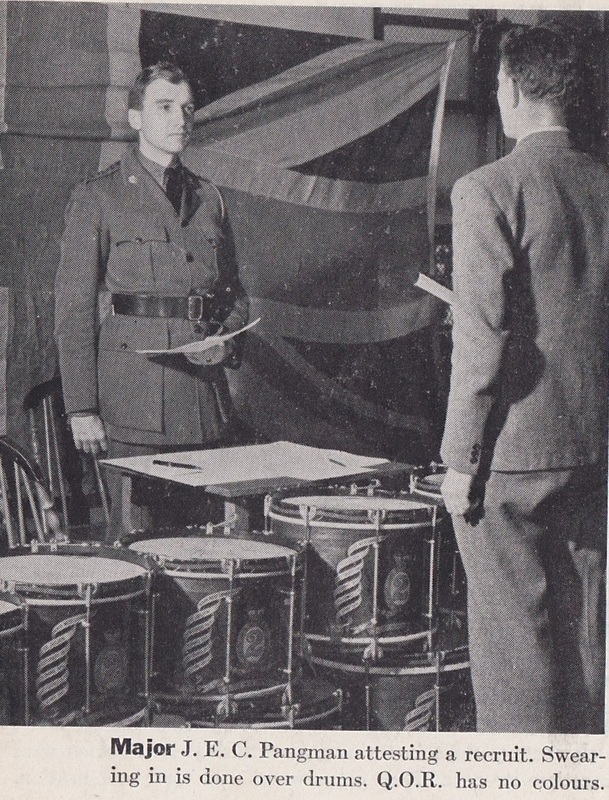 These uniforms were in use and standardized until the outbreak of the second world war. “FULL DRESS TUNIC shall be of black cloth, edged all round, except the collar, with black square cord. Scarlet cloth collar and cuffs, the collar edged top and bottom with ½ inch lace and a traving of black mohair braid inside for Lieutenants; and top only edged with ½ inch lace for Captains and Field Officers; the cuffs pointed, and ornamented as described below according to rank. The skirt rounded off in front, closed behind and lined with black. On each side of the breast, 5 loops of black square cord, with netted caps and drops, fastening with black olivets. On each back seam, a line of the same cord, forming 3 eyes at the top, passing under a netted cap at the waist, below which it is doubled, and ending in an Austrian knot reaching to the bottom of the skirt. Shoulder-straps of black chain gimp, with small netted button at top. Badges of rank in black metal. (a) Field Officers have figured braiding below the lave on the collar, and 1 ½ inch black lace round the top of the cuff, with figured braiding above and below the lave, extending to 11 inches from the bottom of the cuff. UNDRESS JACKET shall be of dark rifle green cloth, single breasted, cut as a lounge coat to the waist with back seam, very loose at the chest and shoulders, but fitted at the waist; waist seam and band, 2 ¼ inches wide; military skirt to bottom edge; length of skirt 13 inches for a man 5 feet 9 inches, carrying in proportion to height, step collar, depth of opening about 3 inches; two cross-patch breast pockets above, 6 ½ inches wide and 7 ½ inches deep to the top of the flap, box plait in centre 2 ½ inches wide, the pointed flap 6 ½ inches wide and 2 ¼ inches deep; two expanding pockets below the waist plaits at the side, 9 ¼ inches wide at the top and 10 ½ inches at the bottom, 8 inches deep to the top of the pocket and fastened at the top with a small QOR button, flap with buttonhole to cover pocket, 3 ½ inches deep, 10 ¾ inches wide, sewn into the bottom edge of the waist band. The top of the pocket should be sewn down at the corners in such a manner that on service the pocket can be expanded at the top also; outside ticket pocket in the top of the waist band on the ride side, inside watch pocket with leather tab above for chain strap. Four QOR buttons down the front, the bottom one just below the lower edge of the waist band. Pointed cuff 2 ½ inches wide rising to 6 inches at the point; shoulder straps of same material as the jacket, fastened with small QOR button, badge of rank and shoulder titles in black metal. SERVICE DRESS JACKET shall be of drab mixture serge, the same colour as issue to the men; single breasted with turndown collar of civilian dress pattern; the opening in front not to exceed 4 inches; collar to be 1 ½ inches in depth behind, increasing to 2 ½ inches width in front of lapel, and to taper to the end; cut as a lounge coat to the waist, loose at the chest and centre of the back, military skirt to the bottom edge; two cross patch breast pockets, 6 ½ inches wide and 7 ½ inches deep to the top of flap, 2 ½ inch box pleat in centre; two expanding pockets below the waist, (pleat at the sides) 9 ¼ inches wide at the top, 10 ½ inches at the bottom, 8 inches deep to the top of the pocket, fastened at the top with a small button, flap with buttonhole to cover pockets, 3 ½ inches deep and 10 ¾ inches wide; the top of the pockets should be sewn down at the corners in a manor that on service the pocket can be expanded at the top, also inside watch pocket, with leather tab above for chain or strap; four large buttons down the front; to be lined or not as required with a lining of similar colour to the jacket; cuffs pointed, 5 ½ inches deep at the point, and 2 ½ inches at the back. Rank badges and shoulder titles in black will be worn on the shoulder strap. SHOULDER TITLES shall be of block letters “QOR” in black metal, 1.2 inch high and shall be worn by all Officers on the shoulder strap. They shall sit upon a piece of red cloth of the same size as a the title. 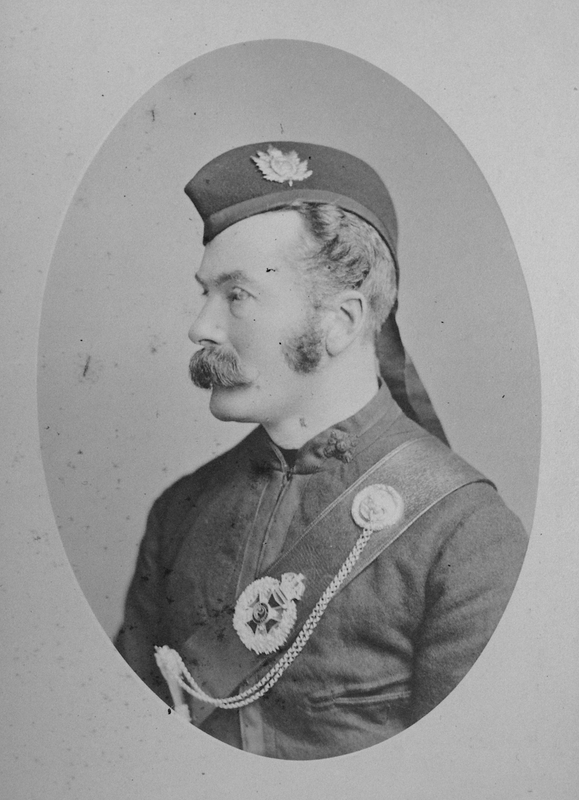 BUTTONS shall be of black material with bugle surmounted with a crown, with the figure “2” in the centre, and the designation “Queen’s Own Rifles of Canada” partially encircling it. Upon the declaration of War the QOR was not selected for the 1st Canadian Infantry Division. 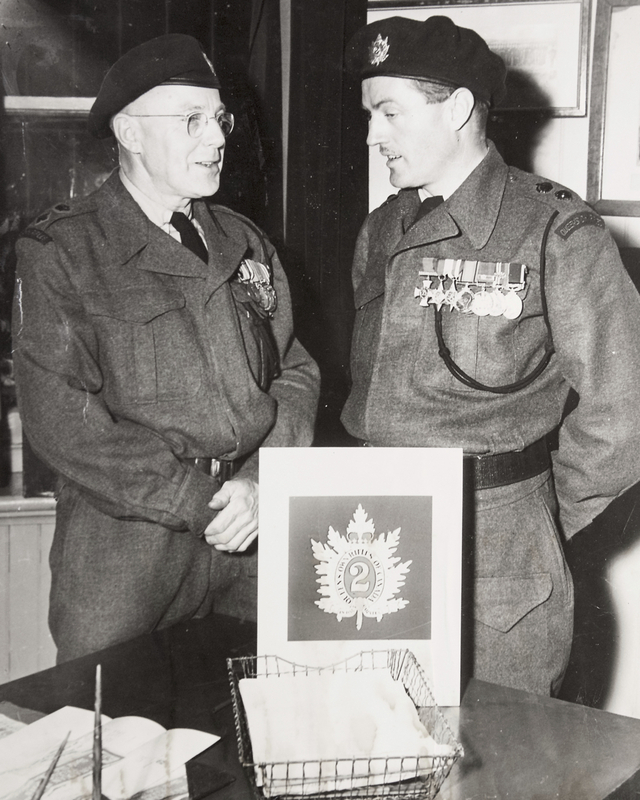 The officers’ service dress continued to be used but all the enlisted uniforms were taken away to outfit the 1st Canadian Infantry Division with only the officers in the regiment being seen in uniform. After September 1940 when the QOR were selected to be mobilized the regiment would be outfitted with the newly introduced battle dress. Battle dress for officers would be worn when not on office detail or walking out. Rank on the battle dress would be of the pre-war black metal officers pip and crown ranks worn on the epaulettes on the blouse. With battle dress—at, or proceeding to or from dances. Anklets will not be worn by officers or other ranks when wearing shoes. (a) All officers on joining the unit will provide themselves with field service uniform, green F.S. Cap, officer pattern greatcoat, badges, etc. In accordance with Cdn. Army Dress Regulations. The Second in command of the Bn. Will be responsible for the dress of Officers. It is essential that officers dress is uniform throughout the regiment; the turn out of the officers is another indication of the standard and discipline of a unit. All officers will report to 2 i/c on joining to see if their kit comes up to regimental requirements. It was common practice for officers during the end and post Second World War era to convert the collar of their Battle Dress blouse to an open collar. This showed a smarter appearance. 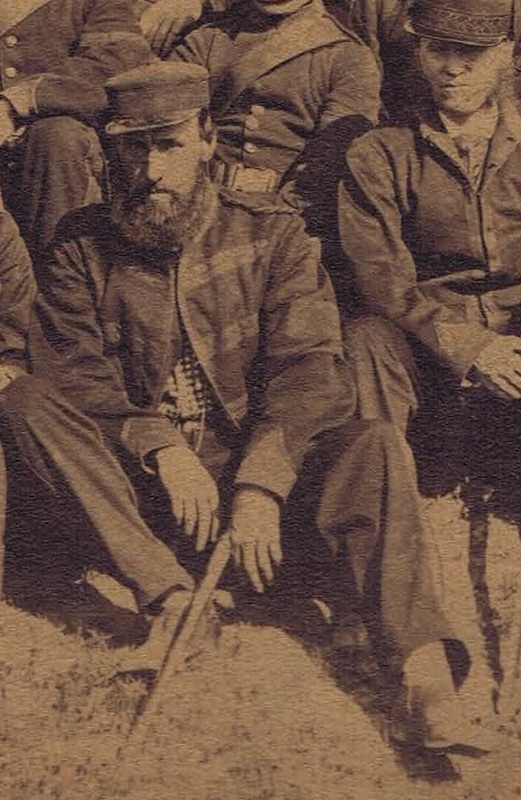 Also in the occupational phase, officers would add black wool to the collar for a more rifleman look. No official orders regarding this have been found. With the adoption of converting the collar of the battle dress blouse, a new blouse was adopted in 1949. This had a permanently open collar which added a more fitting look for riflemen and soldiers in the military. This was worn with a black tie and collared shirt. Army specifications CLO 12-4-1A. Worn by Officers and Warrant Officers Class 1 with Nos 1A, 2A and 2B Orders of Dress and by Officers with No 3A Order of Dress. The shell to be of black Melton cloth. The lining to be of bottle green acetate rayon. Length of cape to be in accordance with individual preference within the following limits: minimum length to reach the base of the fingers; maximum length not to exceed 1 inch below the fingertips with the fingers outstretched. Turn down collar with a 2 inch fall, unlined, fastened with two hooks and eyes and with two silver lion’s faces raised in relief, and a silver hook and single chain. Five 34 ligne buttons, see Section 5 Serial 17, down the front. Centre seam down the back Suppression dart along each shoulder. Detachable. Black linen. To be worn by Officers and Warrant Officers Class 1 with Nos 1A, 2A, and 2B Orders of Dress and by Officers with No 3A Order of Dress. So worn as not to show above the collar of jacket. Detachable. White linen. To be worn by Officers and Warrant Officers Class 1 with Nos 1A, 2A and 2B Orders of Dress and by officers with No 3A Order of dress. So worn as to show 1/8 inch below cuffs of jacket. Army specifications CDA/DID/CLO 7-5-9. Scarlet barathea. Worn by Officers with Nos 3A (except when the waistcoat is worn) and 3B Orders of Dress. Width 4 3/8 inches at the widest point and then tapering gradually to a width of 2 inches at each end; pleated in front, overall length of the pleats 19 inches, the two upper pleats approximately 1 inch in width, the bottom pleat 1 3/16 inches wide at the centre and tapering gradually to a width of ½ inch at each end; on the back of the pleated portion, a 3 ½ inch wide pocket; on the left end, a centre bar slide buckle. Officers and Warrant Officers Class 1 will wear low black oxford shoes, blucher style, heavy sole, toe caps, with Nos 4, 5 and 8A Orders of Dress and with Regimental Mufti. Regimental pattern. Black leather, unlined, with one button or dome fastener. Worn by Officers and Warrant Officers Class 1 with Nos 1A, 2A, 2B, 4 and 6 Orders of Dress and by Officers with No 3A Order of Dress. (Note: The glove described in Serial 11 b, below, may be worn in lieu with No 6 Order of Dress when on training). Ordnance pattern. To be modified by removal of belt, elimination of back-pleat, and shortening of skirt to the centre of the knee-cap. To be close fitted at the waist and to have a sword vent on left side. Sleeves to be roll pressed. 1) Badges, Rank, Officers – See Section 5 Serial 7 a and d.
2) Badges, Rank, Warrant Officers Class 1 – See section 5 Serial 8 A. 4) Titles, Shoulder – Not worn. secured at outer corners with dome fasteners, pockets approximately 6 ½ inches wide and 7 inches deep from top edge of flap; two hip pockets, slash type with three pointed flap, approximately 7 ½ inches wide at the mouth, no buttons, the top of the flap in line with the bottom button on the jacket front; five buttons down the front, the top button always being 1 ¼ inches from the collar seam; two closing hooks and eyes placed at the waistline, the hooks affixed under the left front flap and the eyes on the edge of the right front flap; cuffs blunt pointed 6 inches deep at the point and 2 ½ inches deep at the narrowest point, buttoning two button buttonhole closure on each cuff, i.e., full surgeons cuffs; cloth loop and brass disc with screw recess to accommodate screw-type buttons on either shoulder. Sleeves to be roll pressed. Worn by Officers with Nos 2A, 2B and 2C Orders of Dress and by Warrant Officers Class 1 with Nos 1A, 1B, 2A, 2B and 2C Orders of dress. Stiffened, detachable, of bottle green barathea. Approximately 6 inches in length (according to length of shoulder). 2 ¼ inches in width at shoulder seam, tapering to approximately 1 ½ inches, with rounded end, at shoulder button. The underside to be lined with black cloth. Fitted on the underside with a black tape ½ inch in width across the center and with a black tape ½ inch in width fastened at the outer end and extending the length of the board with a metal eyelet at the inner end. Boards fixed to the jackets by means of loops and screw-type buttons. See Plate 2 Figure 1. Worn with Nos 1A and 1B Orders of Dress. Three cords ¼ inch in diameter of black chain gimp twisted 1 ¼ inches wide, approximately 6 inches in length (according to length of shoulder). Fitted on the underside with a stiffening board covered with black cloth and having a black tape ½ inch in width across the centre. A black tape ½ inch in width fastened at the outer end and extending the length of the stiffening board with a metal eyelet at the inner end. Cords fixed to the jacket by means of loops and screw-type buttons. The folds of the shoulder cords are positioned at the base of each of the pair of ends so that the lower loops of the cords are to the front. See Plate 2 figure 2. Buttons – See Section 5 Serial 17. All 26-ligne. Shoulder buttons to be screw type with removable extension shank to facilitate wearing of shoulder boards or cords as appropriate. Titles, Shoulder – Not worn. Army specification CLO 7-5-13. Worn with Nos 1B and 2C Orders of Dress. 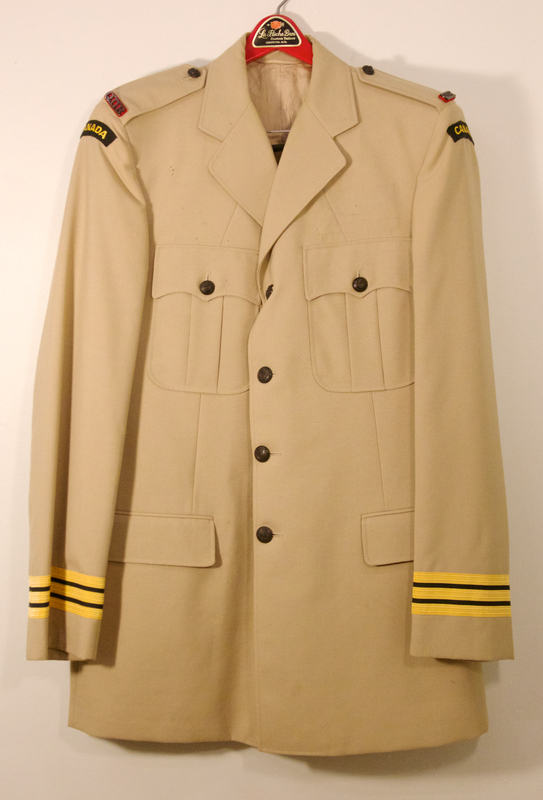 The white patrol jacket will conform to the specifications of the officers patrol dress pattern jacket except that the colour of the material is white, to be of sanforized white drill (Cloth cotton twill), unlined and fitted wherever necessary with sewn eyelets to permit the securing of buttons by means of brass rings. Buttoning two-button buttonhole closure on each cuff. Sleeves to be crease pressed. up collar 1 ¾ inches in depth all around closed by two hooks and eyes and fitted inside with black patent leather tab. Length to reach to the waistline at the sides, the bottom of the back ending in a point at the centre 1 ¾ inches below the length of the side-seams. Shoulder straps 2 ¼ inches wide at the base, tapering to a 1 5/8 inches at the centre of the buttonhole and shaped to a point ¾ inch above the buttonhole. Around the top and front edge of the collar, ½ inch of black mohair braid and around the base a line of black Russia braid. Buttoning two-button buttonhole closure one ach cuff. 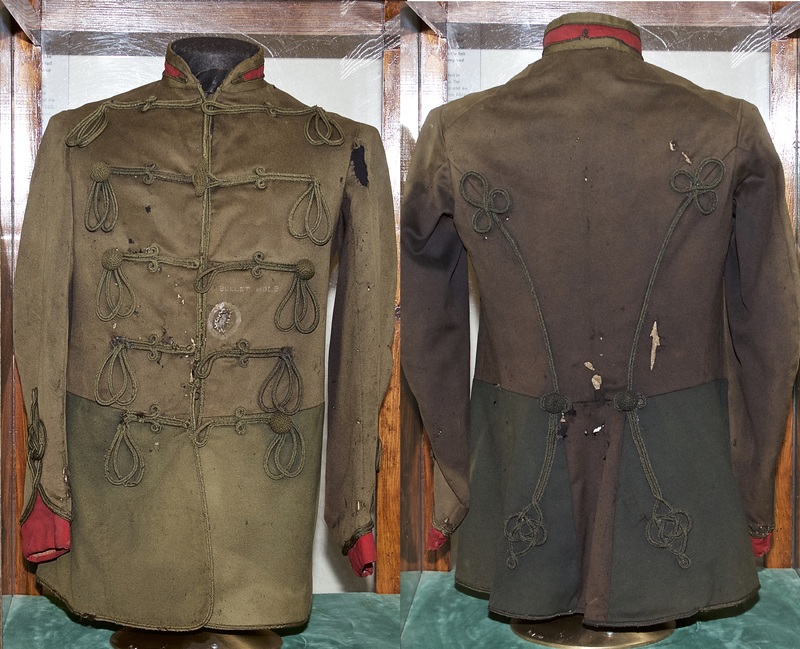 Jacket worn by the Colonel of the Regiment and Field Officers to be embellished with black Russia braid on front and bottom edge, on cuffs and on edges of shoulder straps. Sleeves to be roll pressed. Army specifications CDA/DID/CLO 7-5-12. Worn with No 3B Order of Dress. Shawl collar, waist length. White gabardine (cloth viscose/polyester), inside pockets only, no buttons on the front, an open sleeve vent, buttoning two button buttonhole closure on each cuff. Sleeves to be roll pressed. Army specifications CDA/DID/CLO 7-2-31. Worn with No 4 Order of Dress. Shell of Ordnance stock drab barathea. Colour of lining to match the shell. Single breasted, cut as a lounge coat to the waist, with back seams; loose at the chest and shoulder and fitted at the waist; military skirt to bottom edge, opening at the back from the bottom of the garment to the waistband; length of skirt 13 inches for an individual 5 feet 9 inches, varying in proportion to height; four buttons down the front; step collar with depth of opening about 3 inches; shoulder straps of shell material, 2 ½ inches wide at the base and tapering to 1 ½ inches at the buttonhole; two cross-patch breast pockets 6 ½ inches wide and 2 ¼ inches deep fastened with a button; two expanding pockets at the sides, below the waist, 9 ½ inches in width at the top and 10 ½ inches at the bottom and 8 inches deep to the top of the pocket, with a straight buttoned flap 3 ½ inches deep and 10 ¾ inches wide fastened with a button; top of the pockets tacked down at the corners; pointed cuffs 6 inches deep at the point and 2 ½ inches deep at the narrowest point, buttoning two-button buttonhole closure on each cuff; two black enameled hooks at the waist, one on each side, to support the belt, optional according to individual preference. Sleeves to be roll pressed. Army specification CDA/DID/CLO 7-2-31. Worn with No 5 Order of Dress. Maple Leaf Services stock tropical worsted material. Remainder of detail as per Serial 14 f, above. Sleeves to be roll pressed. Bow, Black, Silk – Worn by Officers with No 3B Order of Dress. Lampwick, Black, Knit – Worn by Officers and Warrant Officers Class 1 with Nos 4,5,6 and 8A Orders of Dress. Tied with a plain knot. Regimental Pattern – Poplin: 50% wool, 50% silk. Width at widest point should conform to the modern trend. Manufactured by Atkinson Neckwear, Ireland, and bearing their label. May be worn by all ranks with Regimental mufti and other civilian garb as appropriate. Not to be worn with uniform. Tied with a plain knot. Bottle green background with red stripes running at an angle of 135 degrees from the wearer’s upper right to lower left as follows, the sequence being repeated as often as necessary. Bottle-green stripe – 10/16 inch in width. Maple Leaf Pattern – Silk. Width at widest point should not exceed 2 ½ inches so as to conform to the modern trend. May be worn by all ranks with civilian garb as appropriate, not to be worn with Regimental mufti or uniform. Bottle green background with a pattern of silver maple leafs. Worn by Officers and Warrant Officers Class 1 with Nos 1A, 2A and 2B Orders of Dress and by Officers with Nos 3A and 3B (except in tropical countries where trousers, see Serial 23 b, below, may be worn in lieu) Orders of Dress. Cut to fit the limbs very closely, and the waist and seat must not show any surplus material. Sitting room is of no great importance, the chief essential being an elegant and smooth effect when standing. Black, elasticized barathea with 2 inch black mohair braid down the side-seams. Strapped under boots with black leather strap and metal buckle. To be cut straight and so worn that the front crease of each leg falls in a straight unbroken line to the instep of the boot. Bottom edge of legs to be so cut as to fit over the instep of the boot without breaking or wrinkling. May be worn by the Colonel of the Regiment on all occasions and by other officers when not on parade with troops. Rank badges will be worn when the British Warm is worn with uniform. Of Ordnance stock Melton cloth. Double-breasted pattern to reach the knee; turn down collar 2 inches deep with lapel and step; tab under the collar to fasten when required to a bone button placed under right side of collar; three 34-ligne brown leather buttons on each side to show; sleeves plain with 3 ½ inch slit and two small leather buttons on each cuff; two horizontal pockets with flap and one inside breast pocket; shoulder straps of same material. Badges of rank as per Section 5 Serials 7 and d. Sleeves to be roll pressed. Officers – Maple Leaf Services stock pattern. Badges of rank not worn. Combat Dress (Olive Drab) – The 2nd Battalion upon deployment to Cyprus in 1967 was issued with brand new stocks of combat dress. Worn with ARMLET, OLIVE, DRAB on both sleeves the left armlet would have the Queen’s Own Rifles shoulder title, the 25th Infantry brigade shield, then with rank underneath. On the right arm replacing the 25th Infantry Brigade shield, the United Nations circular patch was worn. As well, a slip-on was worn on the epaulet of the shoulders of the uniforms. This was the same drab material as the jacket with an olive drab Q.O.R. on a sewn on title. This uniform was worn with slight alterations until 2006 by the 1st, 2nd, and 3rd Battalions of the QOR. The 3rd Battalion did not receive this uniform in full until the mid 1970s. Prior to this the uniform was purchased from surplus stores due to the fact that the militia was poorly supplied. After 1970, the wearing of rank was changed from the armlet. It was sewn directly onto the sleeve of the tunic. Rank was composed of the same colour and thread as the tunic, which gave it a camouflaged appearance for wear in the field. Officers would wear their rank on their shoulders with the bars sewn to the slip on which was worn on the epaulette. Officers would have a new evolution of a unification rank of bars in gold around the cuffs s there was no epaulettes on this uniform. 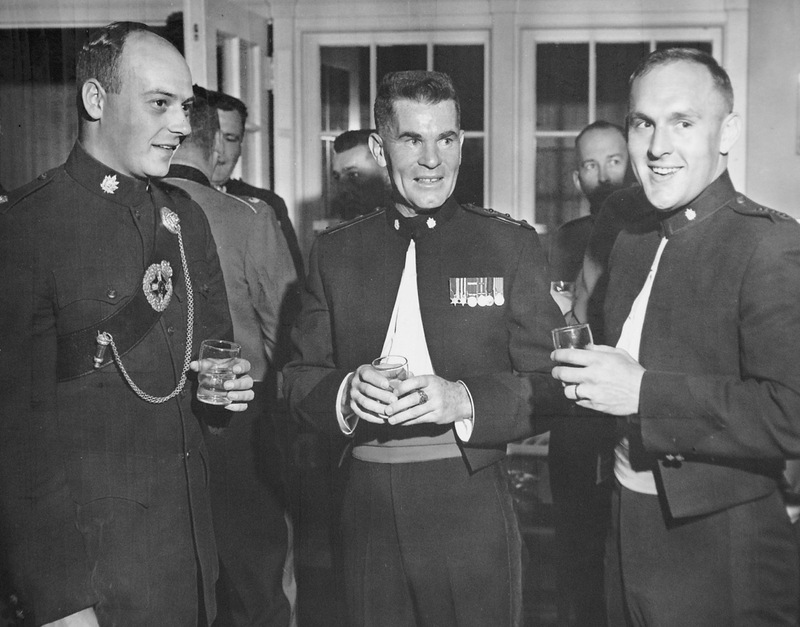 With the approaching unification of the three services of the Canadian Armed Forces a new distinctive uniform was to be introduced for all three services. This uniform which was designated Distinctive Environmental Uniform Greens which was of similarity to Tropical Service Dress which had been in use for the past 20 years, but in green. The 1st Battalion was the first to use this new uniform in the QOR but would be the last they would wear on the disbandment on April 26th, 1970. The uniform lacked epaulets, and under orders to wear gold Canadian Armed Forces buttons as well as no collar dogs. The only item that would signify that the rifleman was QOR was the units cap badge on the forage cap worn and rifle green colour. This changed when the 3rd Battalion was issued DEU greens in the mid 1970s, the wearing of black QOR buttons, QOR collar dogs, and felt Queen’s Own Rifles shoulder flashes were reintroduced. Work Dress – Work dress adopted around the same time as Distinctive Environmental Uniform Greens, this was a new pattern of jacket of dark green cotton jacket, two chest pockets, and a full front zipper. Rank was of a new pattern which had a dull gold thread upon it. 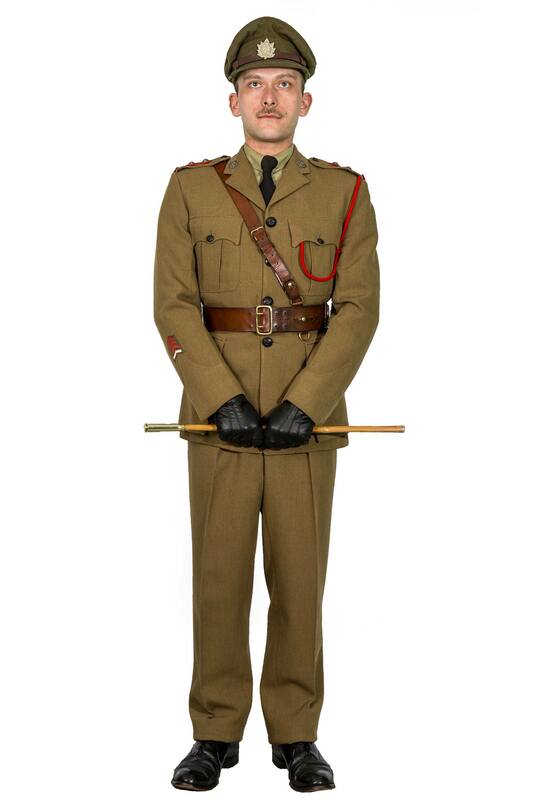 Regimental Full Dress – Around 1985, a new full dress tunic was purchased for use in the Regiment. Officers unlike the enlisted ranks, would continue wearing the patrol uniform that has been worn previously. Parachutist Smock – With the QOR receiving the Parachute tasking to support 3 Commando of the Canadian Airborne Regiment a fresh batch of Airborne rifleman passed their Airborne Indoctrination course in 1983 which were the first members of the parachute tasking. With the operationally tasked to provide an airborne platoon these rifleman were allowed to wear the coveted parachutist smock worn by the Canadian Airborne Regiment. 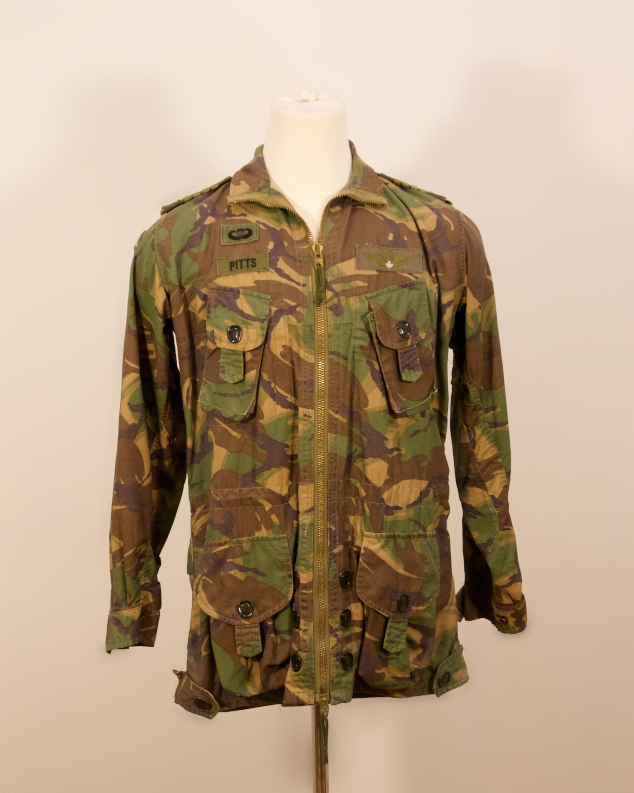 Similar in camouflage as the British combat uniform Disruptive Pattern Material, this smock had a full front zipper, two chest pockets, two waist pockets, epaulets with Olive Drab slip-ons with QOR sewn on, Name tape, and Olive Drab rank worn on both sleeves. This smock was worn as combat clothing (rarely done) and with Work Dress, as well with a maroon t-shirt. Officers would wear their rank on a slip on which was put onto the epaulet of the smock. “Section 3.09 Smock Parachutist, p.306-307. The para smock may be worn as desired or ordered with either Combat or Work Dress. The same condition outlined in paragraph 3.07 reference the wearing of combat clothing to and from place of residence and employment and brief stops enroute will apply. a. Rank and Regimental Badges. (a) Field. Appropriate combat clothing, combat rank badges with Regimental shoulder flashes at base of slip-ons on epaulettes. (b) Garrison. Appropriate work dress, work dress rank badges with CANADA shoulder flashes at base of slip-ons on epaulettes. c. Combat Jump Wing. Worn above the left breast pocket as for the name tape. d. Ranger Tabs. The olive drab pattern may be worn by qualified personnel on the normal position 1” below the seam on the left shoulder. These badges are available from the Regimental Kite Shop. e. US Army Parachutist Wings (Basic Qualification Only) . Black embroidered US Wings are to be centred 1/2” above the name tape and may be worn by persons qualified. These badges are available from the Regimental Kite Shop. f. Other Foreign Para Badges. 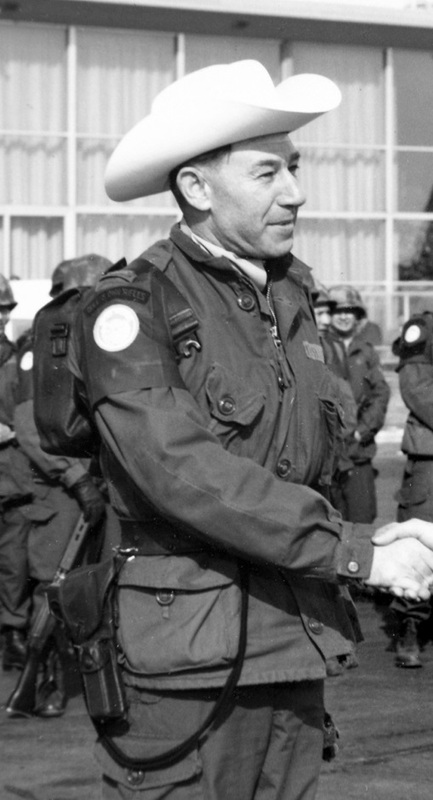 One additional foreign wings may be worn on the right sleeve positioned centrally 1” below the shoulder seam or ½” below the Pathfinder badge where applicable. Basic qualification badge may only be worn. g. Pathfinder Badges. A distinctive cloth pathfinder badge ( subdued ) plate 2, Fig. 6 , may be worn on the right sleeve 1” below the shoulder seam by qualified personnel in accordance with TSQs. h. US Army Special Forces Qualification Badges. The US Army Special Forces Qualification Badge in olive drab is authorized for wear on the left sleeve 1” below the shoulder seam. i. Zipper Position. The zipper as to be done up to a point in line with the top edge of the name tape. j. Shirts. No shirt will be showing at the neck. k. Cleaning. To preserve the waterproof nature of the smock, the manufacturer recommends dry-cleaning. Distinctive Environmental Uniform Greens Version 2 – In March 1988 a new style of DEU Green was introduced to the Regiment. This in similar to what was worn before but the addition of shoulder epaulets which brought back in wear of the black metal Q.O.R. shoulder title. Worn with this was black ties, crossbelts, black waist belts, and black sword carriers. The officers would continue to wear gold bar rank around the cuffs of the tunic. Distinctive Environmental Uniform Tans – In March, 1988 the Regiment was issued a new uniform for summer months. 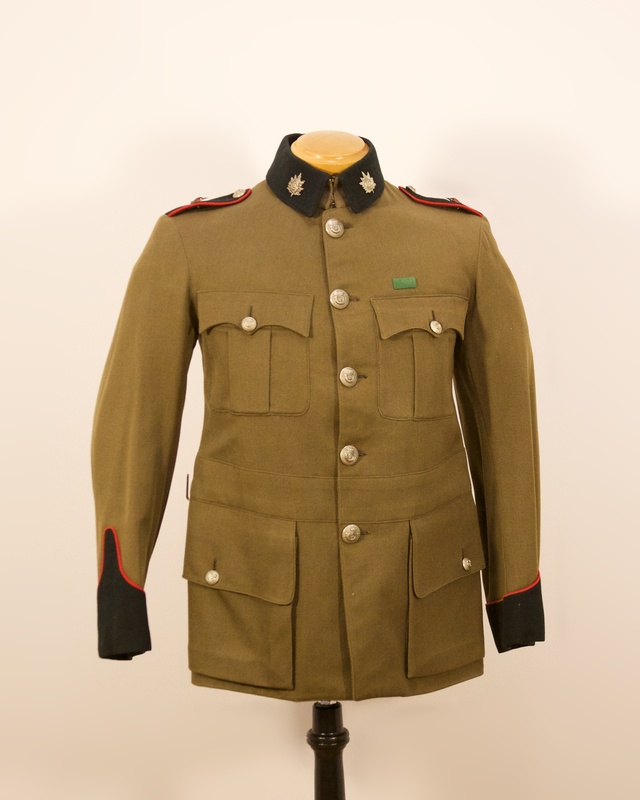 This uniform known as Tans, was to be worn during the summer months and was of similar cut to the DEU Greens but a light weight material. It also included the addition of shoulder epaulets which brought back the black metal Q.O.R. Shoulder title. All badges and accoutrements were the same as with the DEU Greens. Worn with this was black ties, crossbelts, black waist belts, and black sword carriers. 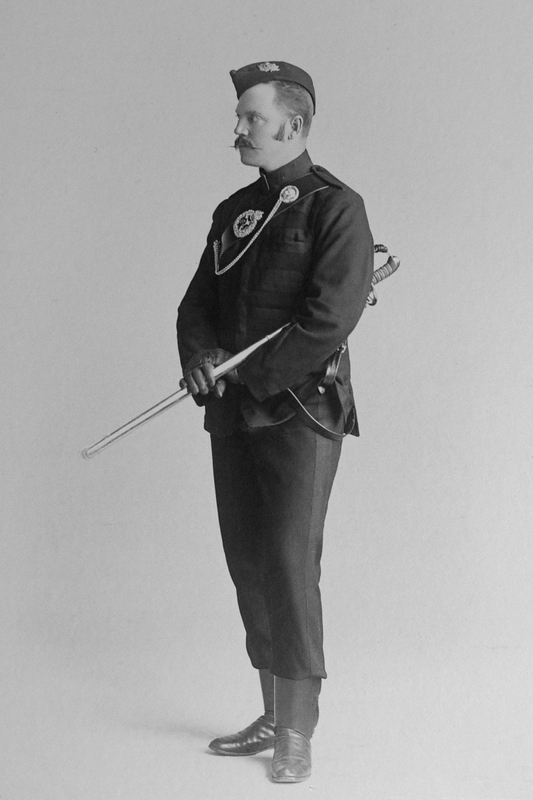 Officers would have no change of previously worn gold bar rank around the cuff of the tunic. Garrison Dress – Around the same time as the introduction of Tans the Regiment was issued a new working dress. This dress consisted of a tan shirt and a camouflage jacket worn with green DEU pants bloused into a new paratrooper like boot, and rank an insignia was of the dull gold thread as with the Work Dress. Within the Regiments’ parachute company, the Smock Parachutist and a maroon t-shirt would replace garrison dress. Slip-ons with officer bars in a dull gold thread would be worn on the epaulettes. 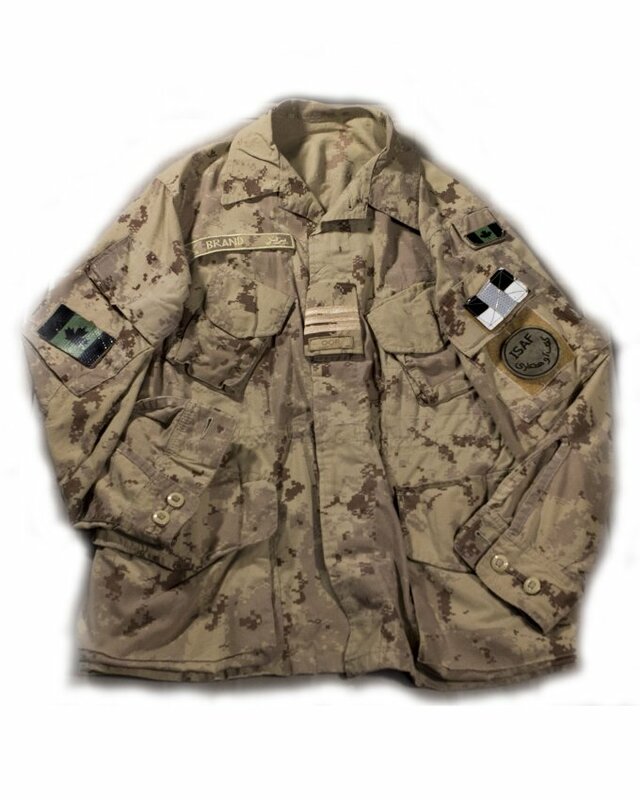 Canadian Disruptive Pattern type 1 (CADPAT Temperate) – Around 2003, riflemen who were deployed to Afghanistan were issued with this new disruptive camouflage developed starting in 1995. This uniform was an exact copy in cut as the Combat Dress (Olive Drab) but in a pix-elated camouflage pattern. Rank was worn on a slip-on that is located center of the chest, of the same material and in cadpat the rank was embroidered with olive drab stitching as well as a Q.O.R. This would be the first time Officer rank would not be worn on the epaulettes or shoulder and would be located center of the chest. Embroidered tab, velcro name tape in olive drab stitching as well, and a velcro coloured and olive drab Canada flags. Canadian Disruptive Pattern (CADPAT Arid) – Starting half way through the first tour of riflemen in Afghanistan the Cadpat Arid disruptive camouflage was issued. This being worn by riflemen up until the pull out in 2015, but is currently still being worn whenever deployed to an arid region of the world. Rank was worn on a slip-on that is located center of the chest, of the same material and in cadpat the rank was embroidered with tan coloured stitching as well as on the Q.O.R. Embroidered tab below. During the first couple years of this being issued olive drab armlets were worn similar to those worn with Bush Dress, Canada flag, and the International Security Assistant Force patch were worn on this armlet. The use of private or base tailors’ arm pockets were added with velcro on them, this brought into the issue of number different types of patches being worn, as well as the addition of a tan Canada flag. Canadian Disruptive Pattern type 2 (CADPAT Temperate) – The main difference of type 2 was the use of covered buttons which put a material covering the button similar to Battle Dress worn in the Second World War up until the mid 1970s. 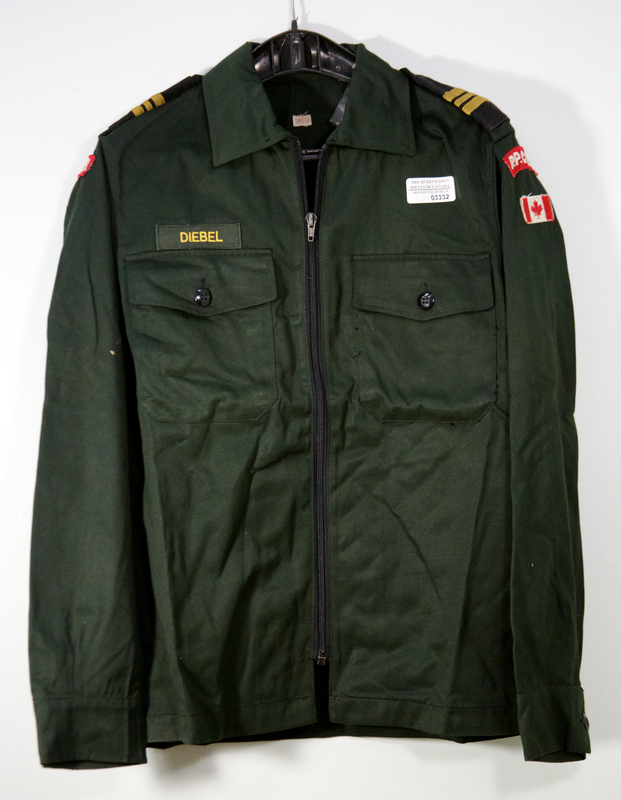 Canadian Disruptive Pattern type 3 (CADPAT Temperate) – The main difference was the addition of arm pockets with velcro similar to the Arid Cadpat. During the same time of the starting of issue the introduction of High Visible ranks was introduced. The slip-on the same as before but the olive drab stitching was changed to an off white which is used on the rank as well as the Q.O.R. Tab at the base, as well as the velcro name tag now produced in the off white as well. With the introduction of the High Visible rank the Canadian Army would change back to pre unification pips and crowns which put a high visible pip on the slip-on. Canadian Disruptive Pattern type 4 (CADPAT Temperate) – This is the first complete redesign of the combat uniform which started to being issued mid 2015. The tunic which is a radical change to what was worn before which was designed for the FN this new tunic is now designed to be worn with body armour. Consisting of a mandarin collar and velcro, arm pocket, pen pocket along the form arm, an action back, and elastics along the sides to help with a better fit. The Canadian flag increased in size to be worn on the sleeve pocket, starting in 2017 Division, Brigade, and 2 specialist courses will be worn on the left and right sleeve pockets. The rank has changed from a slip-on to a velcro rectangular tab in high visible off white with CANADA or Q.O.R. Below, and a velcro name tag in off white stitching. 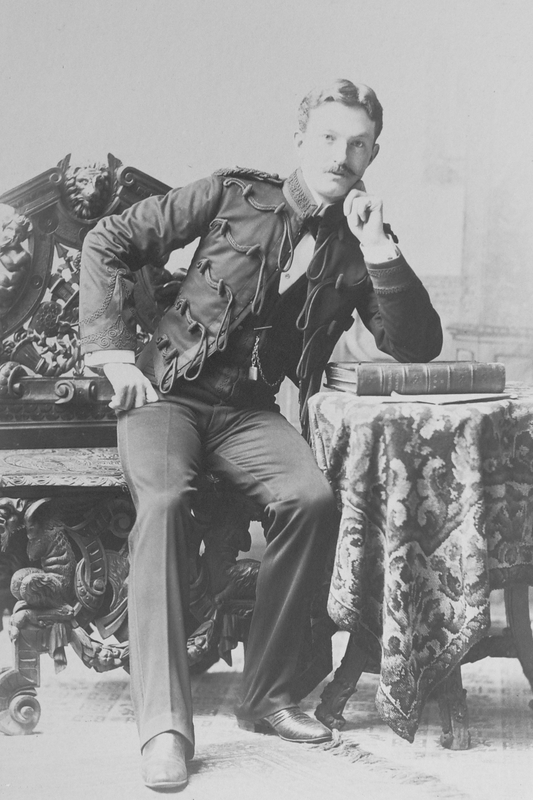 Captain Ernest J. Chambers, History of the Queen’s Own Rifles of Canada (City: Publisher, Date), 48.